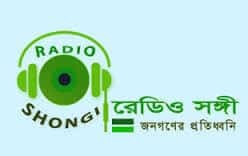 Radio Shongi Bangla FM Radio Live Streaming Online . Listen over 30 Bangladeshi FM Radio Stations Live Online . Radio Shongi Established on 01 November 2012 and officially launched on 23 November-2012 from Bangladesh & UAE . Enjoy Live stream of Bangladesh Music 24 by 7 online . Radio Shongi Established on 01 November 2012 and officially launched on 23 November 2012 from Bangladesh and UAE . They successfully started net casting live from UAE Studio on 23 November, 2012 through the whole world . It is trying to spread Bangla Songs all over the world . It is a 24/7 Live Online Radio . It is proud of its strong varieties of program focus . Aim is to work with our Bangla Culture, folk songs and as well new generation Bangla Songs . It has a large network in Bangladesh & UAE as well in abroad . Dhaka Address : Road-9, Block -G, House -18 , Banani, Dhaka -1213, Bangladesh . UAE Address : Monir Hossain , Ras al Khaimah, United arab Emirates .